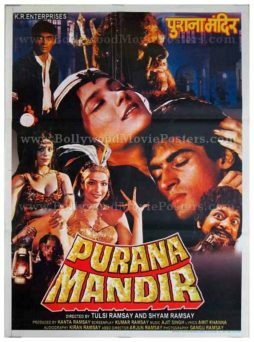 Old Hindi horror film poster of the blockbuster Bollywood horror movie Purana Mandir (1984) for sale. This is an actual surviving Hindi horror film poster of the 1984 Bollywood horror movie made by the undisputed kings of Bollywood horror, the Ramsay brothers. Purana Mandir became a blockbuster hit at time of its release and catapulted the horror genre to mainstream recognition in Bollywood cinema, making this old Hindi horror film poster highly collectible! Printed and circulated during the initial release run of the film (somewhere in the mid 1980s), this Hindi horror film poster was printed for publicity of the movie but never ended up being used. This Hindi horror film poster was originally designed in hand painted oil on canvas format by artist Abbas. Spectacular brush work and imagery dominate the composition of this Hindi horror film poster. A hand painted portrait of the demon/ghost “Samri” is seen on the top left of the poster. The film became a blockbuster hit and pioneered a new wave of horror films in Hindi cinema. This cult classic is regarded as a trendsetting Hindi horror film which made the evil character portrayed in the film, “Samri” a household name in India. Several subsequent Hindi horror films were styled along its plot and storyline. 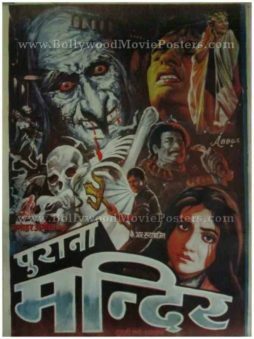 Classic Hindi horror movie poster of the blockbuster Bollywood horror film Purana Mandir (1984) for sale. 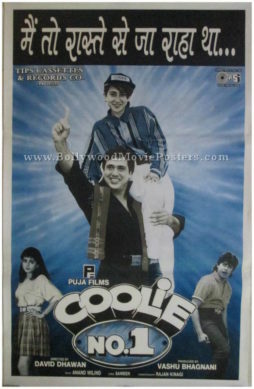 This is an actual surviving movie poster of the 1984 Hindi horror film made by the undisputed kings of Bollywood horror, the Ramsay brothers. Purana Mandir became a blockbuster hit at time of its release and catapulted the horror genre to mainstream recognition in Bollywood cinema, making this poster highly collectible! This old Hindi horror movie poster features a sizzling still photograph of one of the supporting actresses from the film on the bottom left. A photo still of the demon/ghost “Samri” appears on the top of this scary horror movie poster.